Like most countries in northern Africa, Morocco suffers from recurring droughts. In 2016, the country was hit by the worst drought in three decades, followed by delayed and insufficient rainfall in 2017. Recent rainfall has improved the situation, but Morocco could still face water shortages in the coming summer months and beyond. The Al Massira dam is the second-largest reservoir in Morocco, and its surface area shrunk by more than 60 percent over the last three years. The last time Al Massira was at this level was between 2005 and 2008, when more than 700,000 Moroccans were affected by drought and grain production fell by 50 percent. Time-lapse satellite images below provide a stark visual look of the dam’s depletion. Al Massira supplies water to the agricultural sector in the Doukkala area, as well as to many cities, including Casablanca. While the reservoir’s levels keep decreasing, demand for its water keeps increasing. In addition to growing urban water demand and the expansion of irrigated agriculture, the city of Marrakesh plans to tap into Al Massira’s water through a large water transfer project financed by the African Development Bank. The project is expected to be fully operational this year. 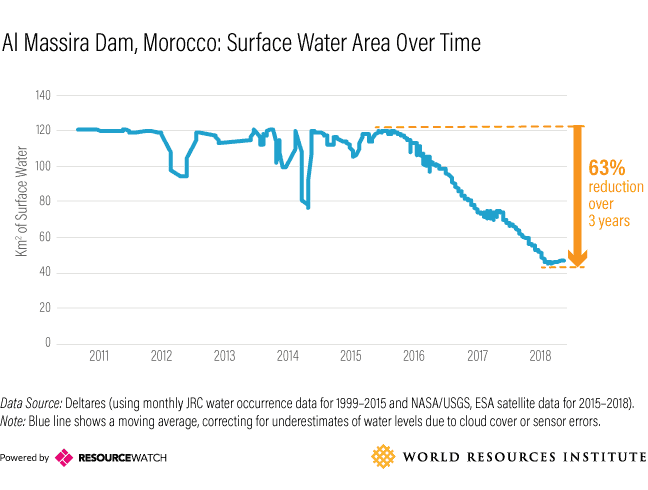 Although it’s impossible to say exactly what the effects of this drought and shrinking reservoir will be, this issue—in combination with Morocco’s other growing water pressures—gives cause for concern. Climate change is expected to diminish water supply while demands rise, resulting in increased water stress. Competition over increasingly scarce resources is likely: Morocco’s urban water demand is expected to increase by 60 to 100 percent in most large cities by 2050. Meanwhile, the percentage of the population employed in agriculture is huge – about 33 percent of Morocco’s labor force, according to the World Bank. These farmers, along with cities and industries, will need ample water resources to succeed. Morocco’s Water Law 36-15 gives domestic and industrial water users highest priority, which in a time of water crisis could severely threaten the agricultural sector’s access to water, disrupting rural incomes and livelihoods. At the same time, Morocco ranks in the middle of the Fragile States Index, meaning it is more susceptible than some nations to destabilizing conflicts, but less susceptible than others. Morocco will need strong water management institutions and adequate social safety nets for farmers to help steer it through periods of intense, prolonged drought. The Narmada River flows east to west through the Indian state of Madhya Pradesh (MP), then through the state of Gujarat before emptying into the Arabian Sea. Poor rains in 2017 have led to a conflict over how much water should be released from the Indira Sagar reservoir in MP to the downstream Sardar Sarovar reservoir in Gujarat. In 2017, Indira Sagar’s peak reservoir water level was 33 percent lower than average, as seen below. Releasing more water would have further reduced the reservoir’s supply during the critical summer period. On the other hand, because the Sardar Sarovar reservoir didn’t get its allocated amount of water from Indira Sagar, its level fell at an alarming rate. The Sardar Sarovar reservoir is the drinking water source for about 30 million people, almost half of Gujarat’s total population, and the irrigation water source for more than one million farmers. As of March 15, 2018, the government of Gujarat has stopped supplying water for irrigation; the state minister has appealed to farmers not to sow summer crops. The low water level has also curtailed Sardar Sarovar’s ability to generate electricity. The minimal water level required for the dam to generate electricity is 110.8 meters. Its current water level stood at 105.5 meters, as of March 15, 2018. To date, 34 percent of the obligated water has been released from the Indira Sagar reservoir to the Sardar Sarovar reservoir. Reports say there is political pressure on MP’s Chief Minister to not release more water, as that could adversely impact the livelihoods of water users, which is a sensitive political issue prior to the assembly elections set for the year’s end. India is a highly water-stressed country and has suffered through many debilitating droughts in recent years. These dry spells have devastated farmers, even driving some to commit suicide. Around 45 percent of Indian citizens are employed in agriculture, making water supply essential for the livelihoods of almost 650 million people. As India continues to struggle with water stress and drought, water allocation decisions may become increasingly contentious. Several risk factors make Iraq vulnerable to the threats posed by water shortages. Iraq is considered a fragile state, with a Fragile State Index score of more than 100 out of 120. Years of conflict have weakened institutions and social services in the country, which is currently struggling to counter violent extremism. There have been more than 6,000 conflict and protest events In Iraq from 2017-present, according to data from the Armed Conflict Location & Event Data Project. Spain and Portugal are currently grappling with extreme drought that is drying up rivers, ruining crops, driving up feed costs for ranchers and sparking lethal wildfires. Spain’s largest power company, Iberdrola, experienced a 58 percent drop in hydroelectric power production due to the lack of water during the first nine months of 2017, which pushed up electricity prices. The drought is also fueling tensions between regional governments. The surface area of the Buendia Dam shrunk by 60 percent over the last five years. Levels this low were last seen in 2006, when the country was going through its worst drought in 60 years. Experts warn that droughts will likely become more frequent and severe in this region, and water stress is projected to increase in many parts of Spain by 2040. Although agriculture accounts for only 3 percent of Spain’s overall GDP, there are 3,000 farms that depend on crops to support livelihoods in rural areas. Spain can boost its resilience to growing water risks by implementing measures to better manage its water, from planting crops that are more appropriate for the local climate to recycling urban and industrial wastewater to reducing food loss and waste. Considered a stable (non-fragile) state, though, Spain is less vulnerable to water shocks than many other nations. The Political Consequences of Falling Reservoir Levels? Most of the reservoirs examined in this blog are in mid-latitude regions, where future scenarios show reduced surface water supply between 2010 and 2040. The threats these areas face today could be just a taste of what’s to come in a warmer climate. Will these shrinking reservoirs and others have destabilizing consequences? More research is needed to identify the degree of exposure and vulnerability to water shocks. It may be that local cities have alternative sources of water supply, such as groundwater, recycled or desalinated water. It may be that there are adequate social safety nets in place for affected farmers. Or the water shock could – together with existing political, economic and social vulnerabilities – precipitate a full-blown crisis, culminating in political upheaval, conflict or mass migration. Water problems are often unseen. Media and even local citizens may fail to notice the problem until a tipping point is reached and disruptive, potentially catastrophic changes begin. WRI and its partners are working on developing systems to detect problems early and mobilize resources quickly enough to avert the worst consequences. The Water, Peace and Security Initiative, a partnership developed by Deltares, the Hague Center for Strategic Studies, IHE-Delft and WRI, will research the links between water and security and develop the first-ever water and security early warning system, housed on Resource Watch. There are more than half a million reservoirs in the world that are at least one hectare in surface area. We examined four. There could be many more reservoirs gradually shrinking, unbeknownst to the people who rely on them. There is clearly a need for a real-time global reservoir monitoring system. The world’s farms, power plants, economies and people are depending upon a stable water supply.